KitchenAid Artisan Mini Stand Mixer in Hot Sauce Red! 1 KitchenAid Artisan Mini Stand Mixer in Hot Sauce Red! A new shade of red and a new series of KitchenAid mixers are here in 2016. This KSM3311XHT Artisan Mini Series Tilt-Head Stand Mixer in Hot Sauce red is a great addition to the KitchenAid stand mixer line. With this mini mixer, you’ll not only have one of the best stand mixers for the small kitchen, but a nice bright color for your counter. If you like the shades of red, this little mixer is a lovely hue called Hot Sauce that is sure to spice up the look in your kitchen. Yeah, it would seem KitchenAid likes to make their mixers some color of food, which I guess is actually pretty appropriate considering they are made to use in the kitchen and to make great food! And since Empire red is the best selling full size Artisan mixer, why not make shades of red for the Artisan mini mixers also? So they’ve got this color red, Hot Sauce, plus the Empire Red shade as well. Hot Sauce KitchenAid KSM3311XHT Artisan Mini Series Tilt-Head Stand Mixer with 3 beaters, 3.5 qt. 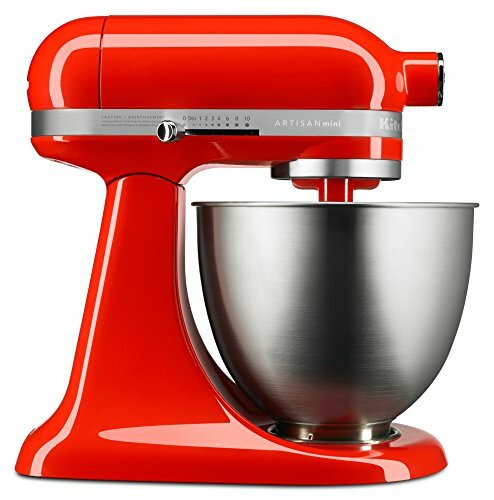 Empire Red KitchenAid KSM3316XER Artisan Mini Premium Tilt-Head Mixer with Flex Edge Beater, 3.5 qt. As you can see, the Hot Sauce mini mixer is a brighter shade of red than the Empire Red. To me the Hot Sauce shade has more of a vibrant, sassy and fun look to it, whereas the Empire Red is a little more elegant and classy. But both are beautiful! If you have a red kitchen and going for the monochromatic look, then another shade of red would work well. Or how about a kitchen painted in a more neutral shade like white, gray or black? 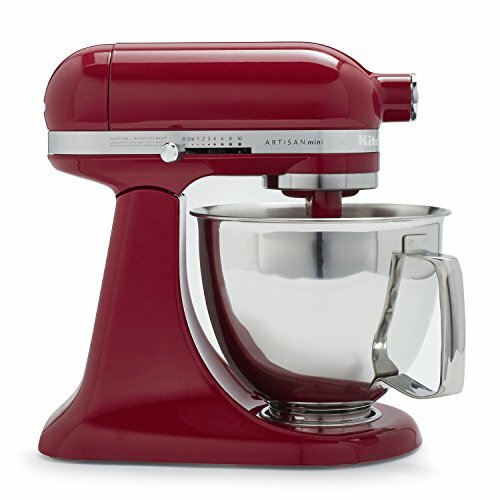 The red KitchenAid mixer would be a great pop of color on your kitchen counter. Go to AMAZON for your Sauce Mini Mixer NOW! Red can be used in a lot of color schemes, but what really matters is you get the color mini mixer YOU like. After all, you’re the one that’s going to be using it, so why not get a color that makes you happy when you see it? Of course the bottom line is that it really doesn’t matter what color stand mixer you choose, a KitchenAid Artisan Mini is going to do a great job. This little mixer has the same motor size as the bigger Classic Kitchenaid mixer, but is smaller size and weight – so it’s got plenty of power to get the job done, but it’s a lot easier to move around than the bigger mixers, and can fit in smaller places as well. Deal #1: Mixer, bowl and 3 types of beaters. This hot sauce colored mini mixer is shown on the left side in the pictures below. 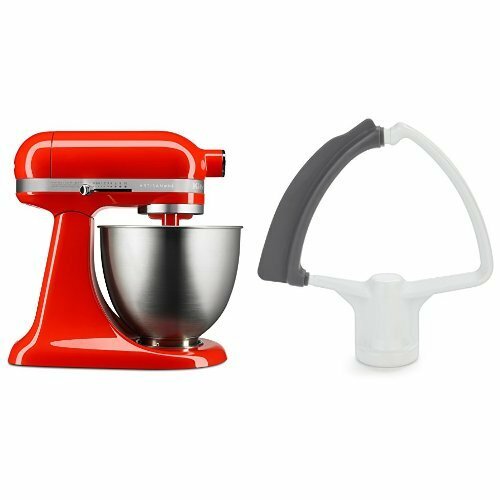 With this stand mixer bundle you get the mixer in hot sauce red, plus it comes with 3 attachments: the flat beater, dough hook and wire whip. (Sometimes it gets confusing talking about attachments: there are different types of beaters you can attach, and then there are the attachments that fit into the hub and allow you to do all kinds of different things using the motor of the mixer). ==> Get deal #1 with 3 attachments by clicking here! Bear in mind that these 3 beaters fit ONLY the Artisan mini mixers. Each series of KitchenAid mixers has a specific measurement between the mixer’s head and the bottom of the mixing bowl, and the beaters have to fit into that space exactly. Otherwise the beaters wouldn’t do as good a job mixing things, or if they were too big they might bang up the bowl! Of course you also get a mixing bowl, in this case the 3.5-Qt. Brushed Stainless Steel Bowl. You’ll notice that both package deals have the same bowl and there is no handle. As I’m writing this post, only a few of the shades can be bought with a handled bowl, and unfortunately, Hot Sauce isn’t one of them. However, if that’s a deal breaker for you, the KSM3316XER Artisan Mini Premium Empire Red Tilt-Head Stand Mixer comes with a handled bowl, so you might want to try that instead. Deal #2. Mini Mixer, steel bowl and Flex-Edge beater. This is the mixer shown above in the picture on the right side. With this package you not only get the Hot Sauce Mini Mixer, but it also includes the special Flex Edge beater. As you can see in the picture, one side of the beater has a flexible edging that keeps wiping the mixture away from the sides of the bowl and back into the main ingredients. That makes sure everything gets well mixed together. You can buy this beater separately if you prefer. Most places it runs for about $40. As mentioned above, this deal also comes with the smooth sided 3½-qt. stainless steel bowl. No handle! In other words, the choice is to buy your red Hot Sauce mini mixer with either the flex-edge beater, or to get it with the set of 3 attachments that includes flat beater, dough hook and wire whip. If you really want all 4 types of beaters, you can also buy deal #1, and then purchase the FLEX EDGE BEATER separately. And it doesn’t really matter which package deal you choose, you’ll get a great Kitchen Aid mixer that’s great for smaller kitchens! And if weight is an issue, this lighter mixer is a lot easier to move around than the larger sized Kitchen Aid models. Investing in an Artisan mini mixer allows you to get a reliable KitchenAid brand stand mixer that comes with a powerful motor, has 10-speeds for mixing to match the speed to the job, and you can add other attachments to make this Artisan Mini even more versatile. After all, even though beaters aren’t interchangeable on different models, this little Artisan mini mixer has a hub that is compatible with all the other attachments like the shredder, grater and more. So if a red Artisan mini mixer with the yummy color of Hot Sauce that looks good and does a good job is the right combo for you, get yours today! ==> Find out more about the KitchenAid Artisan Series Mini Mixers by clicking HERE on Amazon. You can see more info about the little stand mixers in the video. And yes, she’s using a Hot Sauce Red Mini Mixer!